If you keep your brushes clean, especially at the ferrule, they will last much longer and perform well. You have paid good money for the best quality brushes, but it is very easy to ruin them, if they are not looked after properly. To make cleaning easier, remove as much wet paint as possible with paper or kitchen towel. Wash the brush in Zest-it, either Oil Paint Dilutant and Brush Cleaner or Solvent (Citrus Free), to remove all of the paint from the bristles and ferrule area. Press the bristles against the side of the container to release the paint. Repeat as necessary. Having cleaned the brush. Dry on kitchen towel. A wash pot with a cleaning screen, is an easy way to thoroughly clean your brushes. Some pigments stain the bristle, this will not harm the brush. To further protect your smaller brushes, it's a good idea to give them an extra cleaning 'treat'. Dip the brush into lukewarm water, then pull the bristles across a bar of household soap, work the bristles in the palm of your hand, rinse the brush and repeat until a lather is formed, repeat this until the lather is clean and not showing any trace of colour. Once clean, rinse, dry, and shape the brush, and leave to dry naturally. If you have any brushes that do have dried paint at the ferrule end, you can 'breath life back into them' with Zest-it® Brush Cleaner. 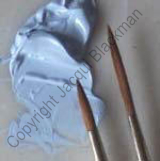 Soak the brush well in Zest-it, then work it into the bristles at the ferrule, by pulling the brush back and forth vigorously across the base of the container to help loosen the paint. You may need to repeat a few times if the dried paint has been there a while. Dry the brush, but don't wash with water, leave it like this for a couple of days, then repeat with the Zest-it. It takes time for the Zest-it to penetrate the dried paint clinging to the bristles, it is not an aggressive cleaner so patience is rewarded. If soft brushes like Mops and Hakes have been used to blend the paint, they can easily be cleaned without 'drowning' them in fluid! Take piece of kitchen towel, lay flat on a surface, add a tiny amount of Zest-it to the towel and then rub the brush hair back and forth to remove the paint. Allow to air dry. Place a small amount of Zest-it Oil Paint Dilutant and Brush Cleaner or the Zest-it Solvent (Citrus Free) into a container suitable for brush washing. Take the worst of the paint off the brush with paper towel and wash as described above, allow to air dry. 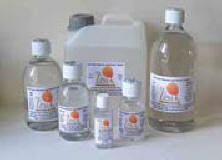 Bottle and label the used fluid, it can be used many times for brush washing.